Summary: Jack likes storms (and Will). The skies were no longer a boiling black mass, more of a dull grey, and there were signs of the sun peeking through off the port bow. The downpour, a thick veil getting in eyes and mouths, blinding, deafening, disorientating, was abating to a gentle pattering, rather than a force of nature to be contended with. The storm that sailors try and outrun, one preceded by skies red as blood, had ceased as abruptly as it had come up. The Black Pearl, despite all of Jacks steering prowess, had run aground. It was only said prowess that had saved her from the nearby rocks and shoals and had beached her, quite softly all things considered, on the sand. Though she was in once piece, she had taken something of a beating in the storm. Jutting proudly out of the waves, the ship was in a prime position for any repairs that would need to be made. A little leverage and they would be able to not only repair the minor damage to the hull but they could careen her as well. For now, in the gentle summer rain, it was just a little too slippery and the sea just a little too unpredictable to try anything. Jack sat in his cabin, listening to the creak and groan of the Pearls timbers. He was cold, his wet clothing rapidly cooling, stuck unpleasantly to his skin. Water dripped off the ends of his beads and tangles of hair, running down the back of his neck and off the tip of his nose and ends of his beard. An untouched bottle of wine sat on the table within arms reach. One leg jiggled up and down, nervous energy running tension throughout his lean frame. He was barefoot, boots upside down in the corner, left to dry out. His hat lay in a puddle on the table and around him sat a similar puddle, formed by the drips off his body and hair. Captain? Will stuck his head around the door. Perhaps it was the electricity in the air, perhaps it was the feeling of adrenaline pumping through his veins or the thrill of the taming of a storm, whatever the reason, Jack had always found storms a powerful aphrodisiac. Normally, if they were near a port, Jack would relieve any tensions he had there. At sea, he would do what most sailors do and find himself a quiet corner to take matters into hand. The crew were, of course, off limits, even if he had wanted- and he most definitely did not- to bed one of them, it would be unseemly for a captain to do such a thing. Now though, since he had picked up William in Jamestown, a good six months past, he had been unable to relieve himself, under any circumstance, without thinking of the younger man. It was becoming distracting, culminating in day dreaming and lapses in attention to important matters, and Jack would not allow himself to become distracted. And so he would fight his arousal rather than simply deal with it. Having the object of his lust come into the room was really not helping. And yourself? Jacks leg stopped its movement abruptly. Oh, and Jack could smell him. Warm, wet blacksmith, all rainwater and musk. He didnt have to turn around to imagine the sight, rain damp curls darkened to the color of burnt honey, droplets sliding down that deceptively muscled torso. Jacks eyes squeezed shut and his fingers formed a death-grip on the arms of the chair. An uneasy silence stretched out between them, Will shifting his weight about from one foot to the other and Jacks incessant tapping. Jacks foot once again ceased to move, his entire posture wound tight and poised. Im fine. Now be a good lad an do like I said an leave me be. Will reached out to put a hand on his captains shoulder but Jack spun around abruptly, catching him by the wrist, grip just a little too tight. I said; Get. Out. The muscles and tendons of Wills wrist shifted under his fingers. A single raindrop trailed down out of Wills hair, over one cheekbone and under his chin to run along his neck and down into the fabric of his shirt. He had meant to let go, but instead found that his grip had only tightened. Will smiled slightly, a knowing expression. So I was right. He pulled his arm towards his body, drawing Jack out of the chair, onto his feet. Jack raised an eyebrow, but for all his outward calm, he still couldnt let go of Wills wrist. Now theres a rarity. He smirked at Will but there was something of hesitation in the expression. Jack couldnt find it in himself to move, fingers going lax until he released his grip on Wills wrist. For a moment his jaw worked a little as he tried to find something to say. When nothing came out, Will leaned forward, put his hands on either side of Jacks face and pressed a light, gentle kiss to Jacks lips. It was barely a touch but Jack reacted like Will had done much more. Without warning, he grabbed Wills forearms and pushed him back against the table edge so Will half sat on the table-top and then put his hands either side of Wills thighs, bearing down on him, crushing their mouths together with something not quite passion and not quite hunger. The position forced Will to lean back so he had to clutch at Jacks shoulders to prevent himself toppling backwards. There was a delightful trembling through his body and Jack pressed him still further until Will had to let go and put his hands behind him. They pulled apart, Will breathing heavily and there was a look in Jacks eyes, not altogether dissimilar from that of the one when he saw the Pearl for the first time in years. Will cut him short with another kiss, dragging Jacks head up by the hair, and kissing him so furiously that Jack could feel his lips bruising against his teeth. Then a strong hand pressed itself over Jacks erection, stroking lightly through the fabric of his breeches. Right then. Jack pulled back a moment, regarding the other man with an appraising look as he tried to catch his breath and compose himself to some extent. Come outside. Jack tugged on Wills sleeve, drawing him towards the door. Jack grinned and pulled his shirt over his head, the fabric sticking and clinging and getting tangled in his hair before he finally let it drop onto the floor in a soggy heap. Step outside an Ill prove y wrong. He opened the door and stepped out onto the deck, bare feet padding softly on the dampened wood. He stared up into the clouds and got an eyeful of rain for his trouble. As if a little unsure, Will stepped out of the shelter and into the warm summer rain. He stood for a moment, then stripped off his own shirt, sending Jack a distinct challenge in his smile. Jack reached out and tentatively put his hands on Wills shoulders, sliding his palms over the slick skin, over his torso and biceps. Christ Will, he breathed. His tan wasnt as deep a tan as Jacks, the sun seemed to have embedded itself into the very core of Jacks bones, but Will was a lot less pale than he had been in his blacksmithing days and the years of hard work, first in the smithy and now at sea, had honed his body to that of statuesque proportions. In the distance, where the storm seemed to be blowing off to, lightning crackled and the faint sound of thunder could be heard. The gold in Jacks smile glinted in the fading light as he pressed Will back, step by step in a sort of half-dance until Will bumped up against the mast. D you trust me, Will? Despite the heat in his voice and the way his hands trailed over Wills skin, raising the fine hairs on his body, there was a serious note in his tone. There was a reddish flush creeping up Wills neck and into his cheeks at Jacks request but he did as he was told. Jack tugged his breeches down over his hips, kneeling in front of Will to stick his tongue into Wills bellybutton, before dragging the trousers off of the raised leg. And the other, Jacks voice was muffled against the taut, damp skin of Wills stomach. Will complied, and then he was bare to the elements and to Jacks scrutiny. Jack rose, smoothly, bonelessly, to stand in front of Will, who had his hands discreetly clasped in front of himself. The younger man, despite his earlier boldness now seemed hesitant. He stepped back to admire the view and though the color continued to rise in Wills cheeks he held the position and it was clear that he didnt mind the attention at all. M not the only one who like storms then, eh? Jack asked with a smirk, one finger trailing down the center of Wills chest. Will ducked his head, curls sliding over his shoulders, and mumbled something softly. Sorry, lad, I seem to be going hard of hearin in me old age What was that y said? He paused for a moment then took a step back, cocking his head to one side. Hold that thought, Will, Ive a better idea. He turned and sashayed up towards the helm, turning once to nod encouragingly at Will. Sink or swim, he said cheerfully. Truth be told, not that Jack was ever all that bothered about such a thing, but he was a little surprised at the lack of protesting that Will was doing. He wasnt entirely sure that Will would follow him up the stairs, but he did, holding the rail so as not to slip on the slick steps, doing his best not to let his embarrassment show. He let Jack press him against the helm, the wet skin of his chest sliding smoothly over the wet wood, Jacks front pressing into his back, Jacks mouth on his shoulder and hands on his hips. There was a length of rope around the helm, Jack used it to tie himself to the Peal in very rough storms, just in case. Now, however, since Will didnt say a word, Jack used it to bind Wills wrists to the spokes of the wheel, Wrapping and knotting the loose ends of rope, with a sailors ease, so his arms were stretched out to either side, leaving him quite at Jacks mercy. It was only then that Will spoke. I said, its not storms. Will tugged slightly, testing his bonds. They held well. Will could see out over the prow and onto the beach where someone had lit a fire, despite the rain, and someone was dancing around it much to the amusement of the onlookers. It seemed to be an impression of Jack. Strains of a sea shanty drifted over the breeze. Oh? Jack knelt on the deck and pressed a series of kisses along Wills hip, punctuated with nips and licks, moving his way across the base of Wills spine and down the other hip. Will tipped his head forward to rest against a spoke of the helm as Jack nudged his legs apart and kissed up his inner thigh. Its you. His voice seemed a little strained when Jack stood and used two other rope ends to cross over his shoulders, crossing over his ribcage and coming over his sides to tie at the front. He tried to move his torso, just to test the limits of his bonds but they held just as well as the ones on his wrists. Jack made a pleased sound and stepped back to admire his handiwork. It really was a sight for sore eyes and for a patience that had worn itself thin, trying not to lust over the young man, to have said young man stretched out like a feast of the senses, it was like every single Christmas and birthday Jack had never celebrated come all at once. Muscles trembled with the apprehension running through them, one lean line of golden flesh, highlighted by the lines of rain trailing over Wills skin. The air was still thick with the ozone the lightning had caused and over the horizon another peal of thunder rumbled through the timbers of the Pearl. Don move. And, with just a hint of irony, Jack left Will tied, stark naked, to the helm and headed back towards his cabin. Jack re-emerged a moment later, sans breeches and holding a small jar. His smile was just this side of mocking. An you said y trusted me. Tsk, tsk. He moved across the deck with the grace of a jungle cat, half prowl. Will froze in place and a sheepish grin crept onto his face. It rapidly changed, his cheeks now bright red as he realized that Jack was now, in fact, naked as he was, and he was tied to the helm of the Pearl, and liking it. If we can see and hear them, Wills voice was embarrassingly tight. Then it stands to reason that they can both see and hear us as well. He squirmed as Jack put one warm hand on his buttocks and stroked lightly. Will made a face, and squeezed his eyes shut as if that could make the crew vanish from sight. The oil was cold in comparison to the rain but Jacks hands were warm and his fingers twisted up inside Will, unyielding but thoughtful enough to brush against the place inside that Will had been told made everything else seem like mist in the background. They had been wrong. Oh god, they had been so wrong and Will choked back something like a scream, wishing his hands were free so he could cover his mouth. The hand was withdrawn and Jack slicked himself with the oil before setting the jar aside. He pressed into Will, slowly, carefully, though the expression on his face showed how much such consideration cost his nerves. His teeth were bared to glint gold and ivory and his pupils had just about swallowed up the iris, breath coming in short, sharp pants. The world did not fade to mist. Rather everything was sharper, clearer. Jacks breath on the back of his neck and cheek, honey and hard-tack, if he craned his neck he could see the fine lines around Jacks eyes and mouth, creasing into a breathless, helpless laugh, his hands, calloused and strong gripping Wills hips hard enough to leave bruises. The Pearl creaked and groaned her approval in harmony with the sucking and crashing of the waves. The rope around his body and wrists was a little rough, a little too water sodden for comfort, and there would be burn marks there later. And then there was the feeling of Jack, moving inside him, oh so slowly. His head tipped back, mouth open so he could try to get enough air to a brain suddenly seeming starved of oxygen. Skin slid against skin, the rain and sweat mingling together and then Jacks hips snapped forward and back and Will let out a cry, partly a strangled whimper and partly a mewl of pleasure-pain, choking on his desire so as not to draw attention to them. Jack was unusually silent, only the sound of his harsh breathing and the occasional half-groan as he pressed deeper inside Will. Will strained against the ropes, muscles standing out with the effort but between them, and the almost painful grip Jack had on his hips he was held immobile. He needed something, more friction, he wanted Jack to touch him but the pirate seemed determined to do no such thing. The rain worked in his favor, Jacks fingers slipped and he tumbled forward, pressed close against Will, changing his grip to put his hands over Wills, awkwardly twisting both their necks for a desperate kiss as if he was trying to steal the air from his lungs, tongues tangled and lips and teeth clashing hard enough to bruise. 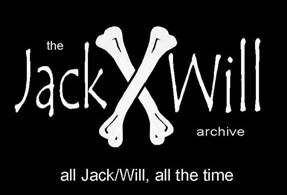 It gave Will the leverage to move his own hips, to press back against Jacks now hard rhythm. He could feel his chest sliding against the wood of the helm, toes curling each time Jack thrust back inside him. He was so close, small tremors starting to run through his legs as he stared blindly at the fire flicking on the beach, rainwater making it hiss and spit. So close, if only Jack would touch him, turn the wheel slightly so he could at least get some friction against the wood. Jack let out a hiss of breath and pressed hard against Will, shudders running through his body. Then he was pulling away, drawing back and Will didnt have a chance to say anything because Jack was pulling Wills legs back, making him lean forward, almost unbalanced, and he was on his knees, between Will and the helm, mouth on Wills arousal and it didnt take very long until Will was shuddering and slumping against the ropes, letting them hold his weight, no matter how it made his shoulders ache. Slightly unsteady and using Will for balance, Jack got to his feet and moved to untie the ropes. Will collapsed bonelessly onto the deck, breathless and sated as Jack slid back down to join him in a warm, wet heap. Sorry bout the rope-burn, Jack said after a while, tracing the marks on Wills skin with one fingertip. They were interrupted by a heavy sounding thunk as a longboat bumped up against the side of the Pearl and Jack was on his feet like a flash, dragging Will up and hauling him towards the safety and privacy of his cabin as Gibbs hauled himself over the side for second watch. The older man caught only a glimpse of their retreating forms and he cast a wary look at the helm, as if to make sure it was going to be safe to touch later on. Bout bloody time, he mumbled, then headed down to the galley to find himself something warm to drink for his watch. Over the horizon the last dregs of the storm rumbled and petered away, the sun finally creeping out from behind the clouds as the rain thinned and then ceased. Inside Jack's cabin, Will sneezed in the sudden dry and cold.